We are constantly looking for ways to save money. What better way than to save at the gas station? There are many simple tricks you can try to get more mileage out of your fuel. There’s no need to buy a new fuel-efficient car to spend less money. North American Wholesale has some great pointers to help you reduce your expenses and grow your fuel mileage. Do you really need to bring your gym bag everywhere you go? No, you don’t. Not only does it take up space in your car, but it also makes it heavier. The heavier your vehicle gets, the more fuel it needs to keep moving. All that garbage and extra load you’re carrying around make your engine work harder and consume more gas. You can probably get one or two more miles per gallon if you lighten your load. Initially, you’ll think that there’s no way that a synthetic oil change can help you save money. After all, synthetic oil is pricier than conventional oil. But switching to oil like AMSOIL’s XL 0W-20 Synthetic Motor Oil can extend your oil change intervals making you spend less money on oil annually. When you do change it, be sure to get one that’s designed specifically for your engine’s needs. If you go for a thicker oil, you’ll be promoting friction and making your engine work harder as regular cars never get hot enough to warm thick oil. On the other hand, a thin oil won’t always provide the type of protection your engine needs. Consult your owner’s manual before making any oil decision, or call North American Wholesale at (866) 580-1008 to get some recommendations for your engine. Take some time to explore AMSOIL’s online store to find the product that best fits your engine’s needs. There’s no point in burning fuel excessively just to get somewhere faster. You’re not driving a racing car, so don’t act like it. Driving slower can save you lots of fuel, keep you safer, and save you from getting costly speeding tickets. You can keep a steady and secure speed by using cruise control. Toyota has some great tips to become a more fuel-efficient driver. Those four wheels that keep your car moving have the power to make you burn more or less fuel. You see, any minimal change in the tire pressure affects your mileage. When you’re driving with under-inflated tires, your engine is forced to consume more gas just to keep your car moving. Your owner’s manual includes the ideal tire pressure you should always try to keep. This level of air pressure creates the perfect balance between gas mileage and traction. You can always slightly overinflate your tires to get more miles out of your gas tank... if you don’t mind reducing their life expectancy. Did you know that the time when you refuel your tank can affect your mileage? Yes, there are times during the day when you’re most likely to get cleaner fuel. 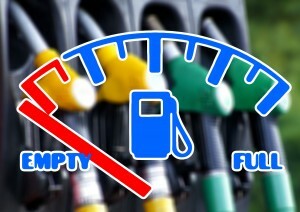 Check out these tips to save some money when pumping gas. When you’re refueling your tank, you should also consider using a fuel additive such as AMSOIL’s P.i. Performance Improver Gasoline Additive to boost your mileage and reduce your car’s impact on the environment. Make sure the gas cap is properly tightened when you refuel. If the cap isn’t screwed correctly, oxygen can get into your fuel tank, make its way into the engine and burn off more gas. You should also check the state of the rubber on the gas cap seal. If it’s cracked or broken down (it can happen as time passes) it won’t seal as tight as it should. Your chosen oil affects your vehicle’s performance and your gas mileage. You better make sure that the oil you get gives you the best lubrication. By getting an AMSOIL Synthetic Oil change, you get the guarantee that your engine will run smoothly for a long time and your fuel consumption will decrease. Whether you choose to change your oil at home or take your car to a mechanic, you can get all your supplies from synthetic oil to oil filters at AMSOIL’s online store. If you need to get some recommendations before you make your purchase or you know why synthetic oil is the smartest way to go, contact North American Wholesale at (866) 580-1008.